This amplifies the difference between two inputs Vp and Vn the low impedance of this configuration is a drawback, but can be used in analog computing. Optimum VCC VDD can be +12/-12. AC signals common to Vp and Vn are canceled by this configuration. Use a capacitor like 10nF plastic from pin 2 to 3 or across R2 to make circuit stable. For AC applications use LF351 TLO71 as they have good slew rate and also are FET inputs. 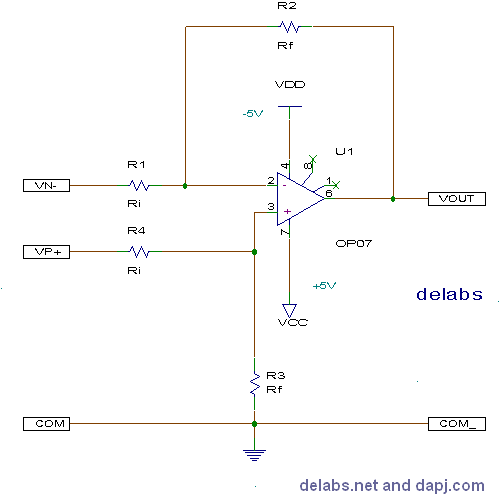 For AC applications use a capacitor (1uF) in series with Ri to block DC Components. The Inputs have asymmetrical input impedance this affects CMRR, also use 1% tolerance MFR resistors for Rf and Ri. One of the biggest advantages in analog computing is stability in noisy conditions, it does not reset. It is also as "Real Time" as real time can be. But more circuitry is required for complex operations. The advancement of Semiconductor Chip Processing Technology makes it possible to develop an Analog Equivalent of FPGA. This may bring back Life into the Analog Designer Lab.